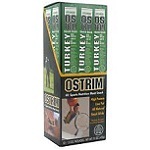 Ostrim specializes in natural, meat stick snacks. 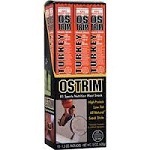 See 57+ Ostrim Reviews and save an extra 10% on Ostrim with Coupon Code* YAG250 at iherb.com/Ostrim?rcode=YAG250. 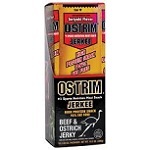 Nutrition: Serving 30 g, Calories 60, Fat 1.5 g, Carbs 3 g, Fiber 0 g, Sugar 1 g, Protein 10 g.
Ingredients: Beef, ostrich, filtered water, seasoning (corn syrup, soy sauce powder, [wheat, soybeans, salt], onion, garlic, hydrolyzed corn protein, flavoring, spice), nonfat dry milk, mustard, and contains 2% or less of salt, citric acid, potassium chloride, potassium lactate, sodium erythorbate, sodium nitrate, sucralose. Nutrition: Serving 42 g, Calories 100, Fat 3 g, Carbs 6 g, Fiber less than 1 g, Sugar 5 g, Protein 11 g.
Ingredients: Turkey, seasoning blend (maple, brown sugar, sea salt, pepper, nutmeg, natural hickory smoke, dehydrated onion), water, nonfat dry milk, mustard, vegetable juice powder (celery powder, sea salt), starter culture.